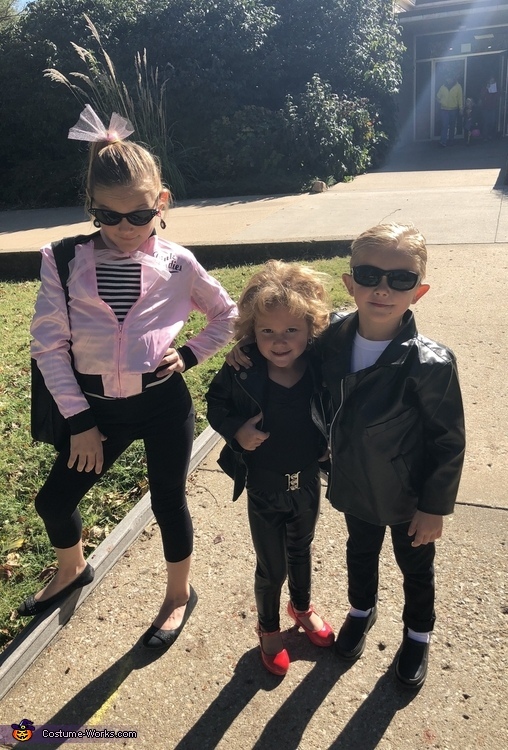 My children like to do costumes that all go together and this year they chose to be the characters from the musical Grease. My oldest daughter is dressed as one of the Pink Ladies. I purchased her pink satin jacket from a store and the rest was just put together with random pieces we found that worked to create the 50’s look. My twins are dressed as the classic Grease couple, Danny & Sandy. My son is super cool T-Bird Danny Zuko. I bought the leather T-Bird jacket already made and then pieced together the rest of his ensemble while paying careful attention to the details from the movie. We went with black cuffed skinny jeans, a crisp white tee, and the classic slicked back greaser hair. For my daughter, we chose to do Sandy from the end of the movie, or as my daughter says “Sassy Sandy”. All of her costume was pieced together with all of the details from the movie in mind. We did a lot of online shopping and thrift store shopping. Her costume consisted of a black bodysuit, leather leggings, a tiny cinch-waist belt, little silver hoop earrings, and even her very own leather jacket. I think what really made her costume shine was the tiny bright red patent leather heels and the super curly, teased hair (my daughters hair is naturally super straight and thin so this was awesome)! They all rocked the perfect attitudes to go with their costumes and had Grease fans freaking out everywhere they went! Strangers were taking their pictures and couldn’t get enough of the tiny Grease Crew!